Animal Confession is an alternative/ambient rock group based out of Ottawa, Canada. It is the brainchild of the band’s sole member – Andrew Gharib. On this three song EP, the influences are obvious: Tool, the Deftones, A Perfect Circle, Nine Inch Nails, etc. Gharib himself notes U2 and Pink Floyd as an influence as well. I’m finding that “A Thousand Lies” is my favorite of these three tracks. The guitars have crunch, the melody is there, the chorus is catchy. It was a wise choice to release this song as the single. The same can basically be said for “Light My Way”, which alternates between dreamy moments and guitar crunch. Next up is “Drown In You”, complete with some guitar distortion and again more melody. There’s a theme here — Gharib has done a great job of combining melody and heaviness. Neither is being sacrificed for the sake of the other. The album is dark, moody and there’s a psychedelic twist given it all as well. Speaking of the man himself, Andrew’s vocals are absolutely fantastic. He does a great job letting the emotions come through in his voice whether he’s belting out the chorus or taking a low-key approach during some the the melancholy moments. The man definitely has a gift and is using that gift to its fullest potential on this EP. I don’t follow the alternative scene much these days so I hate to even comment and what can/cannot be in this day and age but I can’t help but feel Gharib would’ve found some critical acclaim and commercial success in the alternative-friendly 1990s with songs such as these. 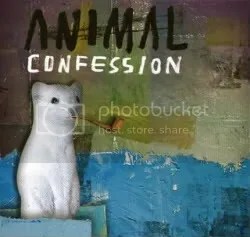 Animal Confession is a “must listen” for fans of alternative music.